I haven't been posting a lot recently because I've had some issues with my internet. Also, I've had the end-of-winter blues and have generally been kinda bummed out. Good thing better weather is ahead! I really miss the sunshine on my face and mild spring breezes. 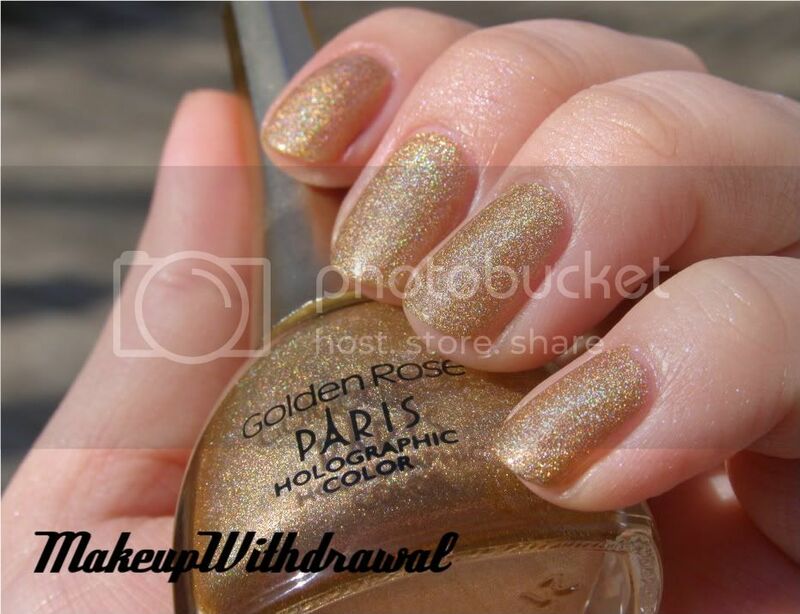 Today I wanted to show you a very interesting holo- Golden Rose Paris Holographic #104. This is from the line of holos that comes housed in a quirky Eiffel Tower shaped bottle. The brush is on the smaller, thinner side but it's adequate. The color is one I've never seen done as a holo before- a toasty golden caramel! It's a bit on the orange side but really glows outdoors in the sun. I do regret that I didn't get very good pictures and that this was the only half decent one. Similar to the Golden Rose holo I showed you last week (click here to read about it), it has a very glossy base and levels well since it doesn't dry super fast like the more matte holos. The particles are fine and it is a scattered holo and a bit dull indoors (and therefore quite safe for work). Though it's a bit subdued, it's still a very interesting color that I bet would look fantastic on a lot of warmer skin tones.